Presses garlic through for finely minced pieces that enhance allyour favorite recipes with delicious garlic flavor. 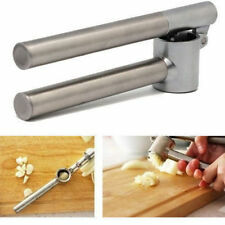 It's made from Zinc Alloyand Stainless Steel that won't rust, bend or break when pressing garlic. 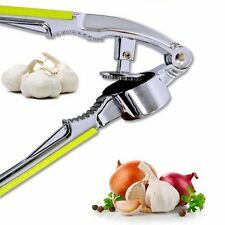 Garlic press KONCIS. Key features. The insert can be removed for easier cleaning. 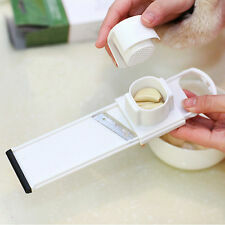 Garlic Press Mincer Crusher and Peeler Set Stainless Steel Cleaning Brush. Garlic Press Ginger Crusher Chopper Peeler Set Stainless Steel Cleaning Brush. - Clove Peeler. 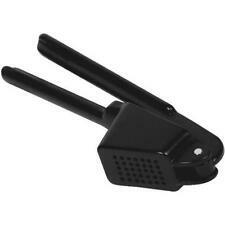 - Professional Garlic Press. Free Bonus: 1 Garlic Peeler. People generally use a knife to crush garlic, and while it’s okay, it is much better to use a press crusher. There’s no need to peel the garlic in order to crush and you can fit a good amount of garlic to press at once. Taylors Eye Witness Funky Garlic Press. This amazing garlic press will not disappoint. Dishwasher Safe. Part of a range, which includes a can opener, an ice cream scoop and a peeler. 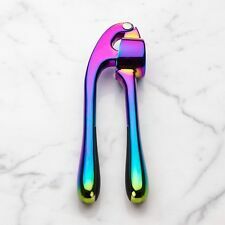 Made from zinc and aluminium alloy and smoothly finished in a stunning irresdescent swirly pink/purple/green/blue design. 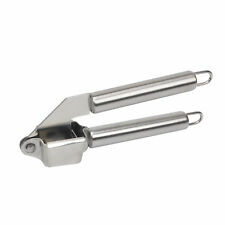 Stainless Steel Garlic Mincer Press Crusher. Grid of small holes designed to make excellent and even garlic paste which will add well distributed garlic flavour to any dish. With this exclusive kitchen utensil in hand, dealing with garlic is no more annoying prep work, but a clean pleasure. Sabatier Professional Garlic Crusher. Made from high quality stainless steel. Fackelmann Basic Garlic Press . .
Insert 1 or 2 peeled garlic cloves. Roll to chop quickly and easily. A new, improved version of the ever popular Garlic Zoom. Chefn' Garlic Zoom. Open to remove blade and chopped garlic. Now with dual gears, the blades chop faster and easier and safer blade removal makes the Zoom easier to clean. Your new garlic masher Press! Use it with garlic to enhance the flavor of your dishes. Material: Stainless Steel. 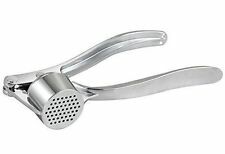 Ikea Stainless Steel Garlic Press Crusher Removable. Insert Cooking Tool Gadget. Removable insert makes cleaning easy. KEY FEATURES CARE INSTRUCTIONS. IKEA KONCIS Garlic Press000.891.63. Stainless steel, Zinc, Brush finish nickel-plated. New and Sealed. The insert can be removed for easier cleaning. Heavy duty British cheese press supplied ready for use. Pictures 3 shows the press in use, applying a 20lbs/ pressure to one of our Tommé molds (Mold 30) sitting on a cheese mat. The press is easily dismantled for total hygiene: the twin pressing plates can be removed for cleaning and are dishwasher safe. Brabantia Profile Line Garlic Press - Stainless Steel. This garlic press has a removable perforated anvil, which makes it very easy to clean. With easy to clean removable grille. Durable and easy to clean - removable stainless steel perforated sieve. Progressive International is your source for the widest range of functional, inventive, and fun kitchen tools and great ideas put into practice. Our in house designers spend hours in the kitchen coming up with ways to improve on a variety of traditional tasks and tools. Established in 1973, our commitment to quality and service allows us to offer a broad selection of quality kitchenware and other household products. There's no need to peel garlic with the Progressive garlic press. Just insert the clove into the well and squeeze the handle. The peel stays in the press while the garlic is extracted from it. Made from aluminum with a non stick coating, it's always easy to clean. A handy cleaner removes the garlic skin from the holes and stores inside the the handle when not in use. This product adds unique drying function for heavy fresh garlic and big garlic. any garlic should not fall into when, high strength stainless steel garlic cage strong. The Material of Garlic Grid: High Strength Stainless Steel. Joseph Joseph Helix Garlic Press - Green. Joseph Joseph Helix. Crush multiple cloves at once. Durable stainless-steel and nylon construction. Easy to clean and dishwasher safe. Easy to clean. Press the garlic to keep the garlic juice seep through the slot opening. -Get rid fo the garlic outer covering. 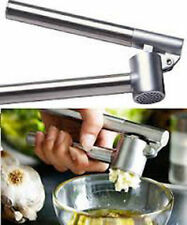 Garlic presser------------1 piece. Features-Its design is light and handy. NexTrend Garlic Twist - green. PROBABLY THE BEST GARLIC CRUSHER IN THEWORLD. Garlic etc easily scooped out. Also available in purple and clear. Easy to clean. Put avarietyof the above ingredients in together to make amarinade or rub. Zyliss Susi 3 Garlic Press. No need to peel the garlic clove. Integrated cleaning tool to remove excess garlic. Lightweight and easy to handle. Easy to use and easy to clean. Garlic is pressed through with one squeeze. Soft, rubber handles absorb pressure on hands. Dishwasher Safe: Yes. The Susi 3 Garlic Press, by Zyliss, allows you to quickly and easily mince garlic without peeling the clove. It has a generously sized hopper that accommodates larger garlic cloves. 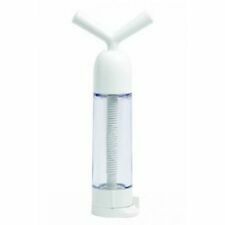 The ergonomic handle makes pressing easy and the integrated cleaning tool makes quick work of cleanup. 1 x Zyliss Susi 3 Garlic Press, Grey. A reinvention of the original Zyliss classic. No need to peel the garlic prior to pressing. In-built tool for cleaning the garlic for the press. 22-02-2019 14:03:01. Taylors Eye Witness Funky Can Opener. Made from zinc and aluminium alloy and smoothly finished in a stunning irresdescent swirly pink/purple/green/blue design. This amazing can opener will not disappoint. Garlic flavors dishes with the fragrance of a rose, giving off a divine scent � until it gets on your hands. Leave odors behind, but capture the essence of garlic, with the Susi 3 Garlic Press from Zyliss. Garlic Press 6" Aluminium. Perfect for mashing fresh garlic or ginger into a fine paste for sauces, dressings, or marinades. Easy to use. KITCHENAID Almond Heavy Professional Garlic Press New Sealed. Condition is New. Shipped with USPS First Class Package. This rubber spatula has a red nylon handle with white silicone blade. The scraper resists heat up to 500 degrees Fahrenheit (260 degrees Celsius) and is stain resistant and will not scratch cookware. This easy to hold garlic press does the hard work for you. This product leaves little waste with minimal effort. Perfect for garlic or even ginger, this is great for making sauces, dressings, or marinades. With sturdy, die-cast zinc construction and a large capacity garlic chamber, the Garlic Press crushes garlic with a simple squeeze. A built-in cleaner allows for easy cleaning; just flip the handles over to clean out excess garlic. NexTrend Garlic Twist - clear. PROBABLY THE BEST GARLIC CRUSHER IN THEWORLD. Garlic etc easily scooped out. Put avarietyof the above ingredients in together to make amarinade or rub. Also available in purple and clear. Fruit & Vegetable Tools Type: Garlic Presses. Model Number: Garlic Press. Also fantastic for chilli's and ginger. The Garlic Twist a winner of 6 major awards. At the heart of each Garlic Twist is a matching set of cross-cutting mincing teeth that allows garlic cloves to be minced to perfection. ✔PRESS UNPEELED GARLIC AND GINGER. As the economical an human design you can easily mince both unpeeled garlic cloves and peeled root ginger. 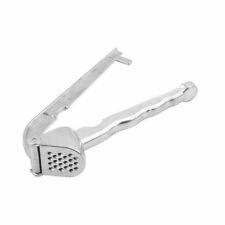 ✔MULTIPLE USES:Use this garlic press you can easily mince both unpeeled garlic cloves and peeled root ginger. GARLIC PRESS CRUSHER. STAINLESS STEEL WITH WHITE PLASTIC HANDLE. Easy To Assemble And Use Garlic Mincer. 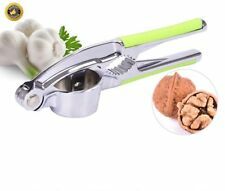 Portable Garlic Ginger Presses Fruit Vegetable Cutter Kitchen Cooking Tool. Simply Pop The Garlic Into The Receptor At The Top, Rotate The Handle And Watch As It Gets Ground Out The Other End. 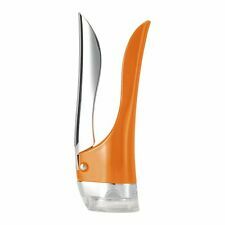 Zyliss Susi 3 Garlic Press No Need To Peel!